Rexall Pharma Plus Canada has prepared a special coupon for customers. 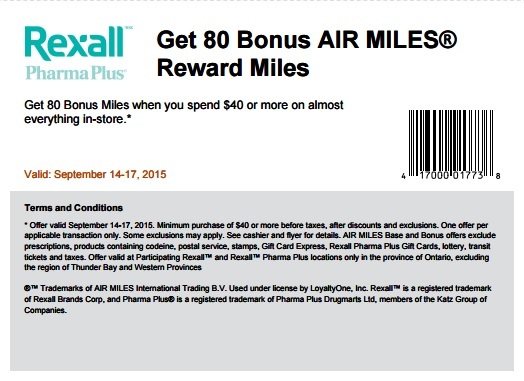 Print out the coupon, visit your nearest Canadian Rexall Pharma Plus store, spend $40 or more and receive 80 bonus Air Miles Reward Miles. Official source of the information is Rexall Pharma Plus Canada. Offer ends 09/17/2015. More information about this promotion available at Rexall Pharma Plus stores.